Just in the process of building the guide in this new format as it is better suited to showing what is found grouped by card type rather than the current random scatterings. Last edited by lejackal on Wed Oct 12, 2016 8:48 am, edited 11 times in total. Please email anything KayBee Overstock related to kaybeesw@outlook.com - really need some SW stickered items, are they out there somewhere? Last edited by lejackal on Mon Jun 13, 2016 1:00 pm, edited 6 times in total. Last edited by lejackal on Thu Apr 14, 2016 9:05 am, edited 4 times in total. This one has a green Toy Box sticker underneath the KayBee coloured Toy Box sticker- thanks to Scruffylookingnh for this one. Last edited by lejackal on Thu Jun 22, 2017 12:24 pm, edited 8 times in total. Last edited by lejackal on Thu Jun 22, 2017 12:30 pm, edited 11 times in total. Last edited by lejackal on Sat Feb 27, 2016 4:30 am, edited 1 time in total. Last edited by lejackal on Tue Mar 01, 2016 5:30 pm, edited 1 time in total. Last edited by lejackal on Thu Apr 14, 2016 8:46 am, edited 1 time in total. They were found by the toy hunter guy Jordan, sold for quite a lot but they do look awesome! That Forest Ranger /Han card combo is so cool! 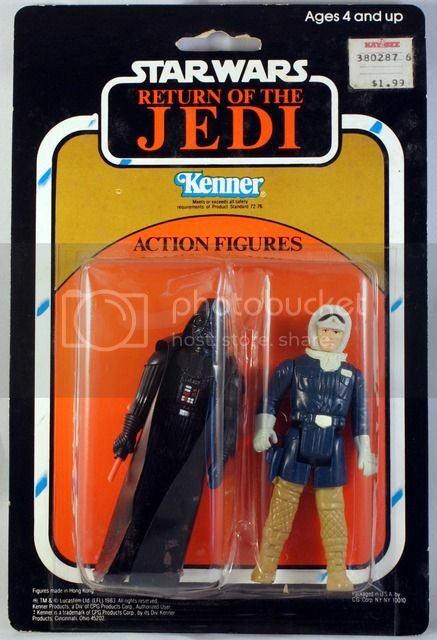 Thanks mate, lovely two pack by the way, is that a Ledy Vader or has the tip just come off the saber?